A couple of further points to add to the "Wealth of Choices" arguments. First, check out this article at The Verge, the upshot of which is that Sony has surpassed Canon and Nikon in U.S. sales of full-frame cameras, reportedly in both dollars and units sold. A linked article notes that "Nikon will try to position its [Z-series] cameras head-to-head with Sony’s. (Even the names are kind of similar)," and "from the sound of it, Nikon is going to kick things off by going straight after Sony’s most important mirrorless line." I don't buy the arguments that more variety isn't possible in the camera marketplace because the companies only develop and build what sells. Bullcrêpe! Companies don't know what will sell; they only know what has sold in the past. That's why most of them keep building the same thing...or building what seems to sell for other companies*. Publishing was my business for a while, and publishers don't know where the next bestseller is coming from. That's why they "spray and pray" by publishing ten new books for every one that makes money. Magazine publishers love to tell you how much "market research" they pay for so they'll "know" what covers will attract attention and trigger newsstand sales, but the fact is that they don't know which cover will sell and which cover won't, or why. (I once actually demonstrated this with a deliberate experiment with the magazine I edited, to refute an outside consultant who had been hired to harass me. Well, maybe that's not why he was hired—it was just what he did.) Do the movie studios know what's going to be popular? If they did there would never be a flop. They game the system and manipulate public opinion down to the gritty nubbins and they still can't accurately predict the hits and misses. The BMW 3-series has a long history of success**, so Lexus builds a nice 3-series clone called the RC-F. High-performance car, gorgeous interior; doesn't sell. Why? No one knows. All this hoohockey about companies only building what sells is nonsense. What, Toyota can't afford market research? And can't independent individuals sometimes guess what might be popular? Don't forget, I wrote an article essentially describing the Fuji X100 five years before it came along. Predicted the focal length of the fixed lens to within one millimeter. The fact is, companies try things and see what works. If companies knew what was going to sell, everything would. They try their absolute best to predict trends, tastes, and sales and they still can't get it completely right. Sometimes they even get it completely wrong***. Next, I never said I cared about whether the manufacturers make money or not. That's not my business—I'm not on their side. I'm on your side. That is, I care about photographers and whether they have what they need to do good work. That's whose side I'm on; that's whose interests I think about. If I worked for a camera company, then I would spend my days thinking about what would sell. But I don't. Take for an example a thought experiment about a postulated imaginary digital "view camera." Imagine a medium-format-sensor camera intended to be used on a tripod in the field that had an integrated viewing screen the size of the Retina screen on a 12.9-inch iPad. Imagine the camera had controls that allowed the application of basic movements in software, but in real time so a photographer in the field could see the effects as he or she worked. In response to that idea, a certain number of commenters would say "I don't need that," or "you could do the same thing with a tethered laptop" (or with some other workaround) or "just use film," or "you could do the same corrections later in post." In another "bin" would be comments such as "it would never sell enough" or "there isn't enough demand" or "the company that developed such a camera would lose money." Still another group would dismiss the idea with what amount to veiled insults like "you're just attached to the past," etc. But to me, you see, all three types of comment miss the point I happen to care about. The question for me is, are there photographers out there for whom the small viewing screens of existing cameras aren't big enough, whose work would benefit from being able to see their subjects more clearly with a much larger viewing screen? Are there photographers out there who would be enabled to do better work if they could see perspective corrections in real time, as they were photographing? If there aren't, then I don't care about such an option. If there are, then I would wish such an option existed. Even if it can't. The variety I would want to see in the camera market is directed at these sorts of issues. Whether it's a viable product for a company to make or not is perfectly rational to consider, because it possibly describes why such a product could exist or doesn't exist. But either way, it's not the salient point to me. I want photographers to be served with what would enable them to do good work more effectively. That's where I'm coming from. And yep, there's always the possibility that Z[x] will out-do A7[x], and be better cameras.****. *Remember how Nikon built the Coolpix A in 2013, going after the success of the Ricoh GR? How'd me-tooism work out for them that time? **I said that instead of using the word "iconic," and you're welcome! ****Heck, I liked the Coolpix A. TOP will be off tomorrow, as Yr. Hmbl. Ed. attempts to rejuvenate by going 24 hours without thinking about photography. Jim Arthur: "I see what you mean. I often consider too many variables when faced with an issue and don’t focus on the crux of the matter. This can lead to inaction on my part. In this case, if the market does not have a wish list, the market research is of no use and things remain the same. You have to make your heart’s desire known." JH (partial comment): "Aha, now you are getting into topics I'm covering in my book on management you inspired me to get back to work on! "Corporations are stupid. Ever hear of the 'Peter Principle'—people in corporations rise to their level of incompetence. Based on 50 years in business, I can assure you that is the case. The people running companies are generally incompetent and the absolute worst people to be running them. A survey of corporate executives in America a few years ago showed the majority would rather be playing golf. Most work to protect their bonuses and some, like Elon Musk, work and tweet on acid (true according to today's New York Times.) Most companies have an idea they start with and few ever have a second good one. After a while they rely on chasing their competition and products become 'me too' copies. They either stagnate or die. "I'll skip the stories about cars and focus on cameras. Maybe. Look at Kodak. They invent the digital camera but let it kill them. They had stagnated and had no idea how to apply the same creativity to marketing that they had in R&D. (Hell, I was helping them develop integrated circuits in 1969, I know how good their R&D was.) Nikon and Canon focus so tightly on each other, they can't innovate much at all. I've seen this in tech companies before. Management refuses to allow innovation because 1.) it's risky and I don't want to risk my job and 2.) that's not what the competition is doing. Olympus was a backmarker so developing a new type of camera (Micro 4/3) was easier, even easier for Panasonic who was not a serious player at all, since the alternative was to continue to fade away. Innovation worked for them. Sony was a tech leader and had no baggage to stop new ideas—ever see the Mavica? Early success showed the idea had merit and justified continuing the process. "Ninety-nine percent of all the innovation going on in photography and camera development today is in the cellphone business. That's where the innovative companies are and more importantly, that's where the money is. That they understand how most users want to use cameras leads to their success. If your interest is along the lines of traditional photographers, you have to live with what the Canikon companies give you—better traditional cameras (what they know) but poor interface to today's digital world. In another decade, they will probably decline similarly to the film photography industry as their market shrinks, revenue and profit declines, and innovation becomes less justifiable." Michael Perini (partial comment): "As for the predictive value of 'Corporate Marketing' I'm not sure you are looking at that in a realistic way. Pick any business that makes consumer goods then narrow that down to a group that has had long term success—say 25 years or more—then narrow that down further to a group that has been so successful that they are now a multi-billion dollar corporation. The most successful enterprises. They could have only gotten there by making lots of correct decisions about what they can sell. For better or worse they all have a process that they use to decide what to make. They know it is highly fallible, but the also know it got them where they are. But if you look closely you will see that they have all had lots of failures. Failures that look really dumb with the benefit of hindsight. It is very easy to cherry pick those and point them out. They all know that it is not an exact science, and if they can be right more than they are wrong they grow. If the balance shifts negative they shrink. If they can't turn it around they disappear." Stephen Scharf (partial comment): "Some points I'd like to throw in for discussion: Its pretty clear to me that you have no experience in formal product development for engineering-based products, or your views would likely be very different. With all due respect, publishing a magazine is the not the same process nor poses the same challenges as researching, developing, verifying, validating and manufacturing a camera, or a DNA sequencer, for that matter. Movies don't qualify, either. Movies and magazines don't have deliver on a set of critical functional responses (aka CFR) and be able to manufacture them in statistical control. Here's some facts for you: any product development company that has and implements a formal and disciplined Voice of the Customer (VOC) process, and then executes and the fulfills on the customer requirements that are the deliverables of that VOC process, then executes on those customer requirements with a high level of engineering specification and quality (by using an approach e.g. DFSS) can, and does, make products that will sell and sell well, all the time. I personally have 10 years of experience and data in the biotech sector to prove it." Mike replies: With all due respect back at you, I do realize that the people charged with developing new products do so responsibly and intelligently. But the limitation of VOC is contained in your phrase "customer requirements." The better the customer can define their requirements, the better companies can fulfill them. Sometimes that's straightforward. But not where real innovation is concerned. It's the focus-group problem: focus groups can only tell you what they think of what they already know about. They can't evaluate what they will like or dislike about products they can't yet imagine. Imagining new ways of doing things is what real innovation is about—it gives customers things they're going to love but that they don't yet know they want. Steve Jacob: "Corporations identify target markets with very wide definitions, but once those markets are defined it is almost impossible to de-silo the entire customer requirements > R&D > production > marketing > sales pipeline from the organisation that is created to service it. R&D are clever folks, but they are given a bucket list and a price point. Whether the list and price point are correct is not within their remit to decide. And so begins a long steady process of refinement of a model range to the point where it is very good, but no longer what the market wants. Their blind spot is that they gather requirements from existing customers and channels. They should be analysing the customers that didn't buy them instead." If your hypothetical view camera is on a tripod, it doesn't need a built in screen ... just have it come with an actual iPad (or use one you already have) and have the image projected to it wirelessly. You might ask why current DSLRs don't support this sort of mode ... and a few do, but not well, and not in a way that allows you full control of the camera, at least in my experience. While we are at it I'd also like a small digital camera that I could occasionally make hover 10-15 ft above the scene for high angle shots so I don't have to carry a ladder. Again, it only has to the be the lens and image capture parts ... it can talk wirelessly to software running somewhere else for the rest. I think there are a ton of ideas floating around for things like this ... but very few are ever explored seriously. Maybe understandably. I liked the Coolpix A too, but the samples showed it with a lens slightly softer at the edges, so I went with the GR. Same with the Fuji version. In truth, the slight variation likely makes zero difference. But for me psychologically, making a purchasing decision, a big selling point for any fixed lens camera, since you are stuck with that lens, is that it comes with a really good one. If Nikon manages to make a full frame mirrorless camera that is in the ballpark of Sony performance, maybe slightly better in some ways, with at least a reasonable number of lenses to start, they will probably sell tons. From what I have heard there is still a fair amount of "churn" on the Sony side. Is that true about Sony overtaking? Or is someone misreading the graphs and statistics given? From what I saw, there was one very important word missed by many, that makes things look a bit different - growth. Sony had higher "Full frame interchangeable lens camera growth." Will Sony endeavour to point out this possible misunderstanding? Yeah, right! Seriously though, when working near my car, I would love on occasion to be able to hold my iPad Pro next to the camera and see more clearly my landscape subject matter, make a few settings and trigger the exposure(s) from it. How about an ability to control a rock solid motorized ball head to play with composition or create multi-frame panoramas - all from the same iPad. Mike wrote, " … as Yr. Hmbl. Ed. attempts to rejuvenate by going 24 hours without thinking about photography." The downside of being in the photography business. The rest of us get to rejuvenate by thinking about and doing photography. Wow, Mike, it appears you woke up on the grumpy side of the bed today. Some points I'd like to throw in for discussion: Its pretty clear to me that you have no experience in formal product development for engineering-based products, or your views would likely be very different. With all due respect, publishing a magazine is the not the same process nor poses the same challenges as researching, developing, verifying, validating and manufacturing a camera, or a DNA sequencer, for that matter. Movies don't qualify, either. Movies and magazines don't have deliver on a set of critical functional responses (aka CFR) and be able to manufacture them in statistical control. Here's some facts for you: any product development company that has and implements a formal and disciplined Voice of the Customer (VOC) process, and then executes and the fulfills on the customer requirements that are the deliverables of that VOC process, then executes on those customer requirements with a high level of engineering specification and quality (by using an approach e.g. DFSS) can, and does, make products that will sell and sell well, all the time. I personally have 10 years of experience and data in the biotech sector to prove it. For example, all of the product development programs I was involved or led the VOC for met and usually exceeded the product revenue projected by their product managers. For example, the ABI Viia 7 Real-Time PCR instrument I led the VOC for was one of the company's most successful products and also had one of the lowst COPQs (cost of poor quality) in the history of the company. This was in face of considerable competition from a similar instrument from Hoffman-LaRoche. The key to having an effecive VOC on the front-end (and DFSS program on the back-end for qualty execution) is not to have the company executives step in with their own agenda/ideas and f**k things up. Mature and disciplined companies, like Honda Motor, Raytheon, Allied Signal, GE, J&J, and yes, Fujifilm, don't let this happen. In the camera industry, from my professional view, Fujifilm has the strongest and most effective VOC process I've seen. Its really clear to me that they listen, and most importantly, ACT on their VOC. I can see it. Look at the success the X-T2 had when it launched, that camera blew Fujifilm's sales projections completely out of the water. The 4th iteration of the camera you referenced, the X100F, also exceeded its sales projections after launch. Clearly, Fujifilm understands their customer's needs well and can translate this intelligence into a very successful product portfolio as well as a very dedicated and loyal customer base. Regading the size of the Z-mount in the new Nikon FF mirrorless camera: that mount is not large enough for a MF camera. It might have a throat diameter where you could possibly cram in a MF sensor, but it won't be large enough to be able to accomodate the image circle from a full range of MF lenses and therefore, will pose significant engineering challenges for MF lens development as a result. For the very same reasons that the Sony E-mount posed real engineering challenges for Sigma and Tamron developing aftermarket lenses for Sony's FF Alpha-series (quote from Sigma CEO: "We don't know why they designed it that way...") Well, Sony designed it that way because it was an afterthought...which how Sony approaches a lot of their product development. No, the size of the lens mount for the FF mirrorless Nikon is to accomodate their projected series of f/0.95 lenses. Nikon has enough work in front of them than to worry about developing a MF camera AND an entire line of MF lenses. They have to focus first on developing a full lens system for the FF cameras, and then, the APS-C camera system after the FF system is out, and lenses for that system as well. Trying to do MF as well would stretch their limited R&D resources way too thin. Remember, Nikon had to lay off over a thousand people last year. No, I don't see it happening, at least for the foreseeable future. This is just speculation by YT talking head specs-geeks, who, from what I've seen, spend inordinate amounts of time speculating about...rumors. Hmm....maybe I woke up on the grumpy side of the bed, too. [With all due respect (said sincerely), I do realize that the people charged with developing new products do so responsibly and intelligently. But that doesn't change the fact that they can't predict the future. Did the developers of the Maxxum 9 not do their jobs responsibly and intelligently? A Kodak rep told me in 1996 that APS was the most heavily researched product system launch in the history of photography, and that with four major photographic corporations and their expertise behind it, there was no chance it could fail. Did Porsche not do due diligence on the 928, its heavily (and very expensively) R&D'd 1978 effort to replace the 911? Maybe the Lexus doesn't sell because those Ginormous Black Plastic Fantastik Cow Catcher Grills are well beyond FUGLY! "Stop assigning godlike omniscience to corporations"
Almost fell off my chair! I worked for a Fortune 500 company for 31 years. Any clue that top management had about consumers was rare, possibly accidental. Many moons ago, I managed a research dept. for them. One of our jobs was to estimate sales of new outlets. Our average was quite close to actual sales, but the standard deviation was poor. Mysteries remain. "The BMW 3-series has a long history of success**, so Lexus builds a nice 3-series clone called the RC-F. High-performance car, gorgeous interior; doesn't sell. Why? No one knows." Can you spell U-G-L-Y? I didn't pay much attention until I had the chance to test drive a Toyata Mirai fuel cell car. Whatever Toyota has, I hope isn't catching. their cars seem to only vary from pretty ugly to amazingly ugly. If your are going to clone a competitor, catch the look and vibe, too. "the upshot of which is that Sony has surpassed Canon and Nikon in U.S. sales of full-frame cameras, reportedly in both dollars and units sold"
So glad to hear that! Not about the fortunes of those companies, though. I just couldn't figure out why people weren't migrating from DSLRs to mirrorless in greater numbers. Seems it turns out they are! I established a similar mental framework when I commented in your Nikon post about Sony already overtaking Nikon as #2 in the US for full frame cameras (2017), and their aggressive plan to achieve the number one position. I _STILL_ love my Coolpix A:) Granted, it's my IR camera, now, but still, far prefer it to the GR. Nikon's definitely going after Sony, but I don't think it's all simply me-tooism. I think without having any supporting facts that one of the reasons Nikon is so late to the mirrorless game is the lensmount - not only in the time it takes to create a new one, but the sea of lenses they're turning away from. Sony's doing well, and they have enough experience now that Nikon coming in isn't a death knell for them - they'll have the advantage of a wider array of first and third party lenses and a multi-generational camera selection that gives a cheaper entry point than Nikon will have for quite some time. To answer your questions about photographers wanting real time perspective and larger view screens: I am one of those photographers. I have built up a set of gear that is essentially as close as I can get to having a digital view camera. DSLR with a large-ish screen (not large enough! ), tripod, geared head, and a tilt-shift lens which I use only for perspective control. I like to print without cropping and get things as right as possible in the frame as I see it in the camera. I've thought about trying to tether an external monitor/laptop/ipad, but I use this setup exclusively while walking and carrying around another device and associated cables just isn't feasible. Given the lens I have I'd be satisfied with just the ability to use my phone as a viewscreen, since it's already twice the size of the display on the back of the camera. Hmmm, how does Nikon expect to succeed going "head-to-head" against Sony, when it depends on Sony-sourced sensors? As to your thought experiment about a view camera type display, my fuji has an app that allows me to use my iPad as a remote. This works great but I need to get some type of hood for it outdoors. I don't need a bigger screen on the camera as it's easier to use either my phone or the iPad. Why does something always have to be a "insert camera brand" killer. I have never understood this obsession with sales by brand. Just because X brand is the top seller doesn't mean it will be the best camera for any particular individual. That said I have owned a GXR (which I adored), a GR, Pentax cameras, and now shoot Fuji. So maybe I am a contrarian...... I have to admit I tried a Sony camera recently a Precision Camera in Austin. I am sure it's a absolutely incredible camera but it felt soulless blob of metal and plastic. I actually like the quirks involved with shooting the X100 and X Pro. It adds to their charm. Another example from Nikon are the three DL's. Those were also cameras apparently designed to compete with Sony products (RX100, etc). The DL's never even made it to product launch. I think your take on the Nikon Z launch is pretty much on the mark, at least within a mm, because it seems likely these cameras will be similar to the Sony A7 series. I doubt we see a transformational product, although there are rumors of a 58mm f/0.95 lens, which should strum up some GAS on the photography forums. The Medium format potential is kind of intriguing. A big 'ol sensor that you could use FX or DX lenses in "crop modes" along with big and expensive medium format lenses would be an interesting approach. One camera for all your lenses. Aha, now you are getting into topics I'm covering in my book on management you inspired me to get back to work on! Most companies have an idea they start with and few ever have a second good one. After a while they rely on chasing their competition and products become "me too" copies. They either stagnate or die. I'll skip the stories about cars and focus on cameras. Maybe. Nikon and Canon focus so tightly on each other, they can't innovate much at all. I've seen this in tech companies before. Management refuses to allow innovation because 1) it's risky and I don't want to risk my job and 2) that's not what the competition is doing. Olympus was a backmarker so developing a new type of camera (M4/3) was easier, even easier for Panasonic who was not a serious player at all, since the alternative was to continue to fade away. Innovation worked for them. SONY was a tech leader and had no baggage to stop new ideas - ever see the MAVICA? Early success showed the idea had merit and justified continuing the process. 99% of all the innovation going on in photography and camera development today is in the cell phone business. That's where the innovative companies are and more importantly, that's where the money is. That they understand how most users want to use cameras leads to their success. If your interest is along the lines of traditional photographers, you have to live with what the Canonikon companies give you - better traditional cameras (what they know) but poor interface to today's digital world. In another decade, they will probably decline similarly to the film photography industry as their market shrinks, revenue and profit declines, and innovation becomes less justifiable. Now maybe I'll work on the car analogy if I can find time. Not quite. Everybody knows - a Lexus is not a BMW - "the ultimate driving machine." Lexus (and Infiniti and Acura) targeted the US market for imported luxury cars by introducing copycat competitors to the Mercedes S-class (big cars). Lexus succeeded because they offered a higher quality S-class at a lower price, taking years before they raised the price to M-B levels. Infiniti failed because their car was not a good looking and had an ad campaign that sold "zen" not cars, something that nobody got. Acura failed because they did not recognize that in America, "luxury" then meant "big." Note BMW is not there - it took years for Lexus to try to compete with the BMW 3-Series and their little car was a dud - I remember a guy who parked his Lexus IS next to my 3-series and said he wished he bought the BMW because the IS seats were uncomfortable, it handled poorly, etc. And who wants a performance Lexus? Where is the tradition of motorsports and performance? Does your image of a racing driver include them getting out of a Lexus? How about a Porsche or BMW M-car. That's not something you can create at an ad agency. Or putting Toyota logos on a cookie-cutter NASCAR car. Al Ries and Jack Trout wrote a wonderful book about 30 years ago called "The 22 Immutable Laws of Marketing." Law 4 is "There is no objective reality, perception is everything." I'm not saying I don't want Nikon to succeed, but Sony is so far ahead of their game right now. Sony seem to be ahead of every other company in sensor technology for still cameras and Fuji are well ahead of almost every camera manufacturer with the exception of possibly Canon. Just take a look at their top tier cine zoom lenses. I just don't think Nikon has anything to offer against these giants, but I guess we will see. In 1913 a couple of well-off young men decided they would like to make some cars. They acquired premises in a mews in Kensington and built one or two cars. The first war got in the way so things stopped until 1919 when they started making cars more seriously. Between 1919 and 1926 they made about 55 cars, until the money ran out and things got wound up. A year or so later, another group of people who had a different, unrelated design bought the company name to sell their (also very fine) cars, and the lineal descendent of that second company still exists. A famous fictional secret agent drove the products of a much later iteration of this company. I've ridden in one of these first-iteration cars and they are perfectly fine -- indeed rather more than perfectly fine -- examples of early 20s light sports cars. In about 1920 a couple of rich (but not Elon Musk rich) people could afford to set up a company to design and make state-of-the-art and very highly regarded sports cars, could make a reasonable number and then stop. At the same time, of course, many other groups of people set up other companies to make cars, with various levels of success. So lots of people who had ideas for cameras started making cameras and there were lots of variously-successful cameras and camera companies as a result. How does that compare to today? Could someone with one or two million dollars start a self-funded car company making practical cars at a reasonable unit cost? Could they design and get into production a practical digital camera at a reasonable unit cost? No, they couldn't do either: doing that requires tens of millions to billions of dollars of investment. This is why there is less variety in the camera market, as there is in the car market: it is now very, very expensive to enter the market, and very expensive for an existing player in the market to try and, probably, fail with a radical new idea. Bamford and Martin, today, would not be making cars in a mews in Kensington, and no more would Oskar Barnack be putting together an experimental camera using film designed for movies. Doing such a thing now requires an enormous investment, a large team of people and the approval of boards of directors and shareholders, who are generally rather uninterested in probably losing their money. I liked the Coolpix A too and bought one new for pretty cheap a little bit after its introduction. It has, on occasion, produced some great files for me. It had buttons and such in different places and sat in my own hands a little better than the GR-D and the x100. I kept picking up each of those at camera stores---they were exactly what I thought I wanted (and of course have some nice features missing in the A, are fine cameras)---but then putting them back down again because they didn't happen to feel right for me. So, yeah, copycats with some variation can be a good thing. ...Mike, I just re-read a bunch of the comments, I didn't really see anyone assigning 'Godlike omniscience" to corporations. My own comment was "Companies make what they think they can sell"
And also these days in nearly every business that also means "stuff we can sell a lot of" Not many are interested in producing neat niche products. There are a few companies that do and they are usually small and structured to work on low volume. If as you point out, Sony has outsold Nikon & Canon I think that is a good thing. Because either it will make them realize that they have been too complacent or too conservative and they will respond with great cameras, or their response will be poorly received, or viewed as too little too late. That would probably be disastrous for Nikon, and a real blow to Canon. Also, if it remains true, do you now think that "Sony has enough of the Pie'? You really ca't worry about stuff like that. As for the predictive value of 'Corporate Marketing' I'm not sure you are looking at that in a realistic way. Pick any business that makes consumer goods then narrow that down to a group that has had long term success, -say 25 years or more, then narrow that down further to a group that has been so successful that they are now a multi-billion dollar corporation. The most successful enterprises. They could have only gotten there by making LOTS of correct decisions about what they can sell. For better or worse they all have a process that they use to decide what to make. They know it is highly fallible, but the also know it got them where they are. But if you look closely you will see that they have ALL had LOTS of failures. Failures that look really dumb with the benefit of hindsight. It is very easy to cherry pick those and point them out. They all know that it is not an exact science, and if they can be right more than they are wrong they grow. If the balance shifts negative they shrink . If they can't turn it around they disappear. Take Nikon who had a long history of brilliant engineering and the ability to create products that people revere and want. With all that, Nikon has been shrinking. The engineering is still there, just look at the D850, but they have also have had the Nikon 1 disaster, the long lack of focus on DX, poor customer service to mention a few. Now they find themselves in a shrinking , zero sum market having waited too long to respond to a new trend. It is generally not considered to be smart business to allow yourself to get to this position, but here they are. They have to swing for the seats. I hope they hit a home run, because if the don't t will likely lead to less choice for all of us. But years later they did make it, and it was a hit, but I didn't buy it, and to my knowledge, you didn't either. The predicting who will buy what is not easy. Having lived through and enjoyed the really broad array of choices we had, I miss them too. But I wouldn't trade the picture making ability I have now for what I had then. We have more ability for more people to take more kinds of pictures than we have ever had. I don't think you can let what we lack it be an excuse. I hope you continue being an advocate for more choice, sometimes a new way of doing old things leads to doing new things. I'm not is any way against any of the camera types you mention, and many would be fun. But neither to I think that any pictures made with them, could not be made with what we have.. It is really tough to be a camera company now, we may be about to see a changing of the guard, but the bottom line is we will see new interesting cameras, but well be less sure for a while who the leading makers will be. So in answer to your original question, I think it is in our best interest to root for every one of them to succeed. 1. Source: The NPD Group, Inc., U.S. Retail Tracking Service, Detachable Lens Camera, Sensor Size: Full Frame, Based on dollar and unit sales, Jan. - June 2018. 2. Source: Sony internal historical data sources. Those are the copied and pasted footnotes from Sony's press release. Cherry picked dates for the six months following a new Sony release and its internal historical data sources don't, in my humble view, amount to a hill of beans. Sure they may indeed be number 1, but I don't think one can necessarily conclude that from the publicly available information. As for the Coolpix A, I had one for a while - bought it new at clearance for about $350 or thereabouts. It was one of the worst camera purchases I ever made, even at that price. It was slow to start up, lacked an EVF (and its LCD was nearly useless in bright light), its autofocus was slow and inaccurate (especially with any subject movement such as walking), and I did not care for its ergonomics. I couldn't sell that thing fast enough. And this is coming from someone whose main camera system has been Nikon since 1994. As I said in the comments about the new Nikon mirrorless the other day - I don't wish for Nikon to fail or even care one way or another. If they make a product I want at a price I can afford, I'll consider it. If not, I won't. And to me, product wish lists are a bit like seeking "utopia": everyone knows what perfection looks like, but no two ideas of perfection are exactly alike. Camera co.s are not omniscient but their survival ultimately rests on their ability to predict what will sell at a quantity and price they can profit from. Whereas for the rest of us, it is just fun armchair speculation and there is no penalty to guessing wrong or wanting more. Still, I suppose there is no harm in wishing for that "perfect" camera! (For what it is worth, for me a perfect camera would be something like an XT-2 with an optical viewfinder - or a Nikon Df with Fuji's better controls - selling at about $1200.) I really like my XT-1's form factor a lot but when push comes to shove, I find myself turning to my DX Nikon with its optical viewfinder and better autofocus. I object to the thinking that something new is a 'killer' of a well established product. Nikon can compete with Fuji GFX but it is very unlikely to kill it. As an example, so far there have been several GR 'killers'. The fact remains that GR is still doing well and all these alleged killers have either disappeared, or are selling at much smaller quantities. Nikon tried, Fuji tried, even Leica got a fixed lens 28. I surely would have bought the cancelled Nikon DL24-85 and two of my friends, one is an architect and the other a stockbroker, were waiting for that DL18-50 with perspective correction. "Bullcrepe". Ah, Nouvelle Cuisine! So, for a hoot, Mike, watch the 2010 movie "The Trip" if you haven't already. You will most likely enjoy it, based on the sensibilities that come across from your great blog. My working hypothesis is that, while corporations are not omniscient, they usually have a better handle on the situation than random pundits on the internet (present company excepted, naturally! actually, you hardly ever "pundit" so you're clear anyways). Not always, sometimes the internals of the company really are so mired in politics and personal beefs that they really are making worse decisions than random internet commenters. In the interest of history I’ll point out that the Coolpix A was released two months ahead of the GR Digital. Both were inspired by the Fuji X100 which had been release two years earlier and demonstrated the demand for a high-end, fixed focal length compact with an APS-C sensor costing about $1,000. Of course Ricoh did have a history of success with their small sensor GRs, but those were a different market. With all due respect back at you, I do realize that the people charged with developing new products do so responsibly and intelligently. But the limitation of VOC is contained in your phrase "customer requirements." The better the customer can define their requirements, the better companies can fulfill them. Sometimes that's straightforward. But not where real innovation is concerned. Regarding your previously posted reply to my comment (which I've included the original version of above): Here's some more info for the gang: Mature and disciplined companies do not use focus groups for VOC; that's the worst approach for reasons I won't go into here, but focus groups are not the right approach for VOC product development. I also used to get from execs and product managers trying to negatively gainsay the benefits of implementing a VOC program or project, a quote from Henry Ford: "If I asked customers what they wanted, they have said a faster horse". This old trope is as incorrect and inaccurate now as it was then. I just heard someone bring it up last week, as it turns out. It's accurate that many customers cannot say, state, or articulate what they want, let along speak in customer requirements language. They don't know what a customer requirement is, they don't care, and wouldn't be able to define one if asked. Hell, most of the product managers, engineers and scientists I worked with wouldn't know a customer requirement if it smacked them upside the head, and ironically enough, they have to work with them to develop products! Its the job of people like me to teach and train them how to properly write customer and product requirements, in addition to the distinctions between requirements and specifications, which are completely different things and were always getting confused with each other, as well. While customers may not be able to say or articulate what they want, let alone state them as customer requirements, they all have NEEDS. Its the job of the VOC & product development team understand WHAT the customer needs are and most importantly, WHY their needs are what they are. The most effective VOC process to do this is called "contextual inquiry". VOC teams go and visit the customer at their site, place of work, in the field, whatever, watch and observe (and if possible, make videos or take photos) of them doing their jobs, driving their cars, using their cameras, whatever, and then sit down and have a one-on-one dialog with the customer about what their experiences, use-cases, needs, emotions and experiences. They then take the verbatim customer interview transcripts, videos, photos from all the customer visits back and then translate all the customer voices and pertinent insights into a set of customer requirements (CRs). The customer requirements, the video, photos and team insights all combine to create a set of customer intelligence for the product under development. By performing importance ranking and formal Kano* analysis survey on the CRs, the VOC team obtains data on the customer requirements that allow them to develop and innovate product functions, features and design concepts that not only meet (the "MUST BE" Kano reqiurements) but exceed customers needs (the 1-Dimensional Kano requirements). In addition to that, and this is the real power of Kano analysis, the team also identify and innovate features and functions that the customer does not even know about that will delight the customer (Attacitve or "Delighter" Kano requirements). Really disciplined teams also use TRIZ** principles to innovate features or product concepts instead of simple brainstorming for functions, features or product concepts. For example, the zoom lens, utilizes a Kano inventive principle known as "matrushka" (nested dolls). An excellent example of mature and disciplined companies using contextual inquiry to innovate a completely new class of products is exemplified in the paper How Honda Innovates J PROD INNOV MANAG 2008;25:261–271, published by the Product Development & Management Association. The approaches Honda used in this paper resulted in innovating two new automobile platforms, the Honda Element and Honda Fit, both of which exceeded their initial sales forecasts. All this has been a great discussion, and only happens at TOP! Some thoughts on all of the above. Starting a camera-company is easier than people think. Imacon (merged with Hasselblad in 2004) and RED come to mind. Cameras can be built with readily availeable off the shelf parts. All you need do is provide an innovative idea. Nikon's copy of the Ricoh GR may have sucked, but Leica sells all the Qs it can build. And 40% of Q buyers are first time Leica owners—this is how you grow a brand. The successful chip fabricators are capable and hold their trade secrets tight, but they get judged on their performance selling chips profitably not on how well sister divisions do. Apple does quite well having its very good and very proprietary CPUs fabricated by Samsung's CPU fab division  even though Samsung's cell phone division is its primary rival. I expect it is the same for Sony's sensor fab division. Then their is the issue of patent cross-licensing: Nikon, Canon, and others have all worked in sensors for a long time and continue to do so; Sony could have the greatest sensor design in the world but if it requires licensing even one patent from a rival it will have to come to the table. generally every other generation, but sometimes split with another fab such as TSMC in the same generation. Variety from a group of companies is one thing. Too much variety from one company can lead to failure. I think of Blackberry, which once dominated the smartphone category, and which tried to accommodate each telecom by creating models unique to each telecom, with a customized OS for each model as well. The logistics were a nightmare to deal with, and is IMO the real reason why Blackberry went into a sharp decline. They couldn't handle it all. They couldn't innovate. Along comes newcomer Apple with just one model to offer and create, with simpler logistics and a greater ability to innovate. Nikon did something similar with its first mirrorless system - Nikon 1. (Remember it?) Instead of sticking to a couple of basic designs that could be refined, they kept changing overall designs, batteries, etc. They would have had to assume unnecessary costs that made the system less profitable. "Nikon is responding to Sony's rising market share in FF cameras by poaching the successful A7[x] lineup with two copycat products." All this talk of customer needs focuses on technical features, but ignores the emotional desire of people to be members of a tribe. Apple captured a tribe with the Macintosh, (essentially all the people who hated IBM, of which there were a lot in the 1980's). They've been riding that philosophy ever since: technically their products are on par with the competition, but they carry that Apple cachet that keeps their customer base motivated and constantly brings in new fans. Fuji captured its own tribe with the X100 - essentially all of us who would love to own a Leica but can't justify the expense - and worked their way in to a saturated market that was in the middle of a shakeout. I wish Nikon all the best, but unless they can generate the kind of visceral attraction that transcends the spec sheet, they have a tough task ahead of them. "The question for me is, are there photographers out there for whom the small viewing screens of existing cameras aren't big enough, whose work would benefit from being able to see their subjects more clearly with a much larger viewing screen?" If so, and they don't have a solution already, they aren't paying attention. There are already several solutions on the market. Those I know best and have used are Oly Panny and Sony. 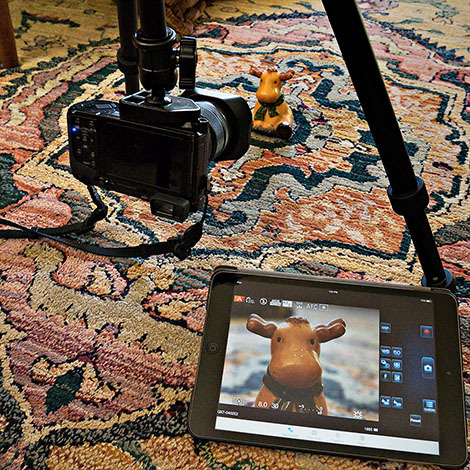 Herewith the Panny app being used on an iPad Mini to remotely control a GX7. I could just as easily have used and Oly camera and their app. Both offer control over all exposure settings. I could also have used a larger tablet, such as an iPad Pro. The Sony app is a bit more bare bones, but does work reliably on my A7. I was just looking at the Nikon app, for a P1000, and it does look primitive, largely useless, hence the opportunity to sell a special IR remote control. (With receiver only on the front - stupid.) I have no idea how the Canon, Fuji, etc. apps work. Then there's the Arsenal camera remote control for ". . . most Canon, Fuji, Nikon and Sony DSLR and mirrorless cameras." It looks to go far beyond remote control, with its AI Smart Camera Assistant, and things like focus stacking on cameras that didn't come with it. I have no idea what remote control they may offer, but there are many large auxiliary LCD screens offered for video use. Speaking of taking a chance on an innovative product, how about the Olympus Air? This is a camera without a screen. 57 mm in diameter and 83 in length, with a lens. It's tiny, but has the same µ4/3 sensor as an E-M5 II. There's a simple, effective mount on the back to hold a smart phone, but it can easily work with any iOS or Android tablet. The wireless connection uses both WiFi and Bluetooth, and gives seamless viewing and control. Yes, the concept is flawed - with Oly's lenses; the camera is too small to include IBIS and it desperately needs it if used hand held. Fortunately, the Panny 12-32 zoom is the same diameter, tiny and includes OIS. The matching Panny 35-100 zoom also is a good fit with OIS. There were several reviews, here from Imaging Resource. BUT, someone tried making and selling it! And I tried it. It does work well. Have they flown off the shelves - no. Has it led to another product from Oly or others - not yet. "But either way, it's not the salient point to me. I want photographers to be served with what would enable them to do good work more effectively. That's where I'm coming from." ". . . or with some other workaround." I take your point, overall, but it seems to me you've gone overboard in the effort to have a long list. What's a "workaround"? "Cameras that are radically simple and de-complexified;"
Don't they all come with an "iAuto" Mode these days? Spin the dial to that, and just push the button to take a photo. Or in the other direction, they all come with full Manual Mode, as well; watch the exposure meter display and set speed and aperture. It's like my first real camera, a Nikon Ftn, or my second, an OM-1. I could even only change ISO every 36 exposures! Huh? Just put a big card in and never look at it again. Have them do it in the store or have a friend do it, then forget it. I just checked. My Olys will work fine that way. Just plug in the USB cable to download the photos. Or use the smart device app to have them appear on your device and send them off into the ether. Slow and limited, to me. Downloading a few hundred files with a UHS II card and reader is almost infinitely faster. And I have been known to need to change cards in the field. But, really, it's a non-issue. A camera or two with a square sensor...."
Many contemporary cameras come with the option to set the resolution, in both number of MPs and format. No, OM-Ds don't, but at least many Pannys and Canons do, and probably others. Want a 480x480 pixel camera? Just have that friend or store clerk set it, or dive into menus once, and you've got it. "Cameras that dispense with JPEG modes and options to reduce menu and processing complexity;"
Hey, it's a menu option, set once and forget. I never shoot JPEGs. I never use JPEG modes and options. I never think about them. Might That be the problem, head space? Is it necessary that the unused options Not be there at all? Oh, that sounds snarky. It's not meant to be. It's just that I don't "get" the need for dedicated cameras to do what most can be set to do. Set and forget, if one wishes.